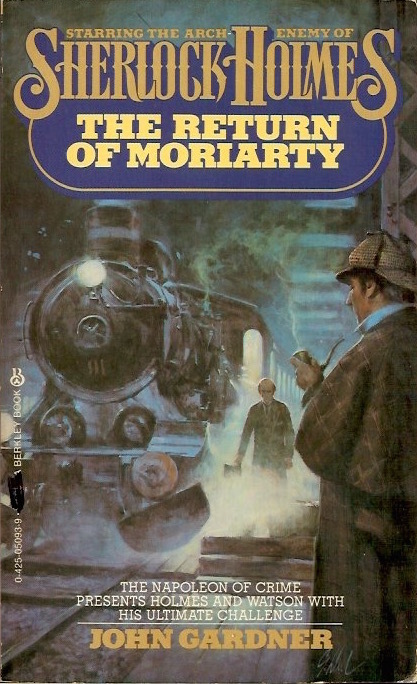 First published in 1974, this is a 1981 U.S. Berkley paperback edition of John Gardner's The Return of Moriarty. The series cover art ties it in with Berkley's Conan Doyle paperbacks, making is appear pseudo-canonical. Gardner would pen a sequel, The Revenge of Moriarty. London is in a terror. The streets are filled with dippers, makers and bullies of every description, all collecting "contributions for the Professor." But Holmes saw Professor Moriarty swept over a waterfall in Switzerland! Could it be that Europe's Master Criminal somehow survived, and has returned to battle Holmes again in the greatest crime due of all time? It could indeed.